Amazon is taking another page out of the brick-and-mortar playbook, this time by launching its own shopping channel to promote products on the platform called Amazon Live, as first spotted by TechCrunch. The copying of physical stores’ strategies may be extra stinging to retailers because Amazon controls about half of the United States’ e-commerce market, ahead of more traditional stores like Best Buy, Macy’s, and Walmart. 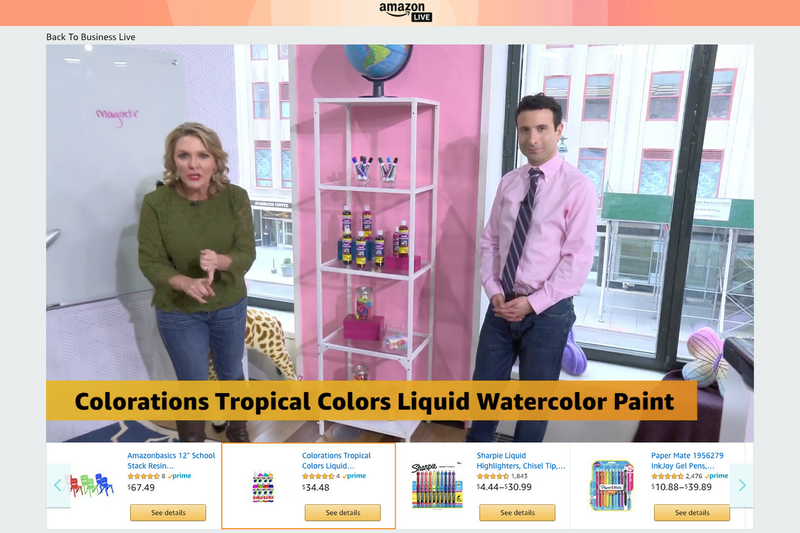 On the list of companies that Amazon has crushed in market share is QVC Group, which broadcasts its own shows where hosts chat about available products, making it easy for people to watch along and buy. Amazon is now mirroring this approach with live streams available on its site and through a new app called Amazon Live Creator. The app seems to be aimed at smaller brands to record their live streams and serve as live forums to field questions from customers and demonstrate the products in use. Unlike a traditional home shopping channel, the app allows multiple live streams to happen at the same time, like a bizarre cross between Twitch and the Home Shopping Network. Right now, it’s streaming a smart home live stream promoting the Amazon Echo Dot (naturally), a Valentine’s Day Gift Shop stream discussing a chocolate fountain, and a Back to Business channel that’s talking about a tempered glass whiteboard. For Back to Business, Amazon has actually recruited YouTuber The Deal Guy. Some of the product selection is honestly a little clever because the average person probably doesn’t know that you can buy a chocolate fondue fountain from Amazon. In between each live stream segment, there are ad breaks that advertise the Amazon Echo Dot again. That’s right, Amazon Live is basically just an ad within an ad. When it comes to Amazon products, there are few physical stores where you can actually see goods in person. The company has run mall pop-ups, and now, it has its 4-star stores in California, Colorado, and New York, as well as its cashier-less Go convenience shops. But those stores definitely don’t carry Amazon warehouse products like the whiteboard or chocolate fountain. When shopping on the main Amazon platform, customers typically have to take care to see through the fake goods and the fake reviews. So shopping online involves a lot of vetting customer reviews, photos, and videos to see what’s worth buying, especially with larger purchases from more unknown brands. Given those obstacles, it makes a lot of sense why Amazon would want to expand into live stream shopping. The real question is if people are even willing to sit through these videos. Each show goes through about 30 products per stream, and the hosts discuss whether they find them useful or not. (Do you really want to hear people list off all the different color markers you can buy?) Amazon is already driving record sales in North America, but with the shopping live streams that seem aimed at middle America, it looks like the company isn’t loosening its grip on this demographic. Amazon Live is already available on the site, but the app is currently only available if you have an invite code and an Amazon account. We’ve reached out to Amazon to see when that will change.